The Camacho and Rujero rivers, which flow down from the Andes mountains, pass through Rujero's vineyard first before continuing on to others further down the valley. This ensures that only the purest water, closest to the source, feeds our centuries old vineyard. In the spirit of keeping it real, the name Rujero is itself steeped in Bolivian lore. Rujero is derived from the Spanish word rujir meaning "to roar." The Rujero river, which runs through our vineyard, is normally more like a trickling creek than a mighty river. However, when it rains in the surrounding Andes mountains, the creek swells into a rushing river whose roar echoes throughout the valley. This is how Rujero singani got its name. Rujero was it... hands down. When the Jesuits arrived in Tarija's high elevation valleys more than two hundred years ago, they planted grapevines alongside ancient peppercorn trees. Today, Rujero's vineyard is the last one where these original grapevines still grow uninhibited. In recent years, some of Bolivia's singani distillers modernized and scaled up their production facilities by importing industrial-sized stills from Europe. Rujero chose a different path. Rujero's master distiller teamed up with a local metal craftsmen to build their own small-batch copper stills by hand, customizing them for the unique characteristics of Bolivia's high elevation grapes and distillation process. Ultimately, our core mission is to share Rujero with the world for the benefit of the people who continue to craft this premium singani according to Bolivia's centuries-old traditions. 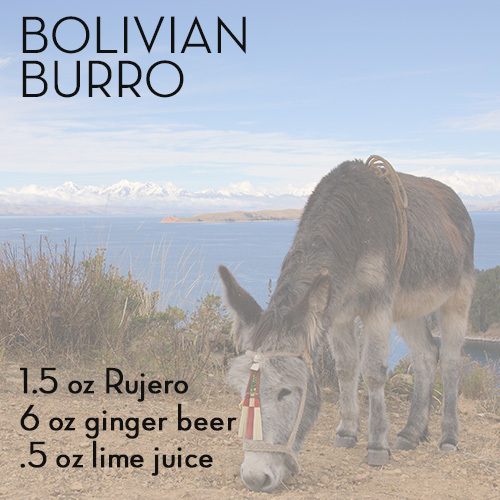 In fact, the beauty of Rujero is how many different Bolivians contribute to the final product -- from the grape harvest to the distillation to the bottling to the labeling. Indeed, because so much of the value-added work is done in Bolivia, roughly every 25 acres of grapes planted lifts 10 families out of extreme poverty.